For Shreya Badonia, Journaling was hobby when she was a kid and now she has converted her hobby to profession by writing a book “The Silver Lining Journal”. Exercises consist of prompts, a planner, a series of questions, checklists and a productivity table to define your life. Silver Lining Journal is also the only self Help journal published in India, says Shreya. I am Fashion Communication graduate from NIFT Bengaluru. 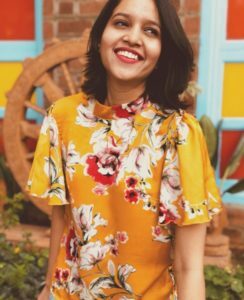 I work as a creative lead in a fashion startup based in Bangalore. I joined this role after a few months of publishing my first book Silver Lining Journal I read and watch sky in my free time. I was working as a freelancer before my current full-time role, which allowed me to focus on writing and publishing my book. I was lucky enough to be in a creative field and I enjoy what I do but then I wasn’t fulfilled with what I was doing. I spent the first 20 years of my life struggling to find the real me. I didn’t know what I wanted. I had no clue where I was going. But fortunately, the notion of finding myself was strong enough to make me dig deeper into my life. Journaling was my favorite hobby as a kid and luckily I never stopped journaling even after growing up. It was a great escape from reality into a world of your own, into your own words of self. Not only professionally but even in my personal life, I was struggling to place myself. I felt like a stranger in my own body. I felt I like didn’t know myself. I could feel the missing pieces within me which motivated me to write my book. I think I’d be where I am and doing exactly what I am doing. The messages from my readers are so heartwarming. They are a testimony that my work is making a difference in so many lives and I think is my drive. I get up at around 7-8, practice my morning yoga for 20 minutes followed by a 10-minute meditation session and then get ready for work. Come back home around 7-7,30 and relax for a bit and then either read a few pages or interact with my readers. I try my best to hit the sack before 11.30 every day. No, I do not have any regrets in life. Everything that has happened good or bad has shaped me and alter the course of my life. There are certain things that I wish were a little different but I treat them as lessons and not regrets. People think that I was always the confident and strong woman that I am today. But they don’t know how much I have worked hard on myself to be where I am. I have learned to believe in myself even in the worst of situations and trust me it doesn’t happen overnight. I deeply thankful to each and every one of you who’ve read my book and those who have read my answers on Quora. Your life is in your hands, do not let someone else sit on the driver’s seat. Take the wheel and follow your passion without any doubt. You recently came up with your book “The Silver Lining Journal”. Can you tell us more about it? 10 years of journaling has taught me the real meaning of the quote mentioned above. I have transformed myself through journaling, I have come out of my worst phase by writing about them. Journaling has helped me become who I am today, and this book is a way to help others experience the same. Every chapter in the book teaches you a pivotal lesson about life and primes you up for the journaling session which has exercises in the end which makes it an interactive book. You definitely won’t yawn during reading this but think hard about what you are doing with your life. Exercises consist of prompts, a planner, a series of questions, checklists and a productivity table to define your life. Silver Lining Journal is also the only self Help journal published in India. What inspired you to write the book? Any particular incident that you can remember that played a big role in your decision. Journaling was my favourite hobby as a kid and luckily I never stopped journaling even after growing up. It was a great escape from reality into a world of your own, into your own words of self. The inkling of discovering myself was at the peak during the last couple of years of my college life. My peers knew what they wanted from life and where they were going, unlike me. I didn’t have a clear vision. I was confused between numerous options available, which led me into deep chaos. Not only professionally but even in my personal life, I was struggling to place myself. I felt like a stranger in my own body. I felt I like didn’t know myself. I could feel the missing pieces within me. After a long self-analysis and self-talk, I stumbled upon my old journals. Journals I had written in my early teens, journals I totally forgot about. I flipped page through the page. Every page told me a story about me which I had misplaced after growing up. Every journal entry brought me closer to the real me. Every word made me feel at home. I found myself in the torn pages of my old journals and the story doesn’t end here. I started journaling extensively afterwards and used my journal more than just writing about my day or experiences. I wrote about my dreams, my goals and planned my day, my week and my life. We spend months planning a weekend trip. How often do we plan our life? We know everything about our favourite celebrity. How much do we know ourselves? We know what our friend is up to, but do we know what we aspire from our own lives? I spent months talking to people and asked them about a few fundamental questions about themselves. And what I found out after this little survey was astonishing. “I have no damn idea.” 90% of people responded in the same manner. They had zero ideas about them and their lives. All these learning from my personal life invoked the idea of Silver Lining Journal: A Journal to rediscover yourself. 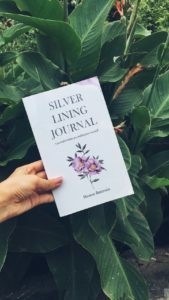 I designed Silver Lining Journal, which is also the first journal book published in India, in a way that helps people find themselves through the art of journaling. How difficult it easy it is to be a writer? Being a writer is not that difficult. You only need to pour your heart out on a paper. But sharing them with the world in the rawest form makes it challenging for some. In the initial days, I used to keep my writings to myself, never got the oomph to share it with anyone else. Ever since people started noticing my work on Quora and I realised that words have the power to change people’s lives, I let go of my fear an started writing more. The writing part as I said before, is not really difficult but what comes later is. Publishing a book in India is a daunting process. But if you’re passionate about your work then nothing can stop you. Your perseverance and hard work will get you through any hurdle. Any advice that you would like to give to people who want to take up a career in writing. Writing has infinite options. You need to find your niche and your objective of writing. You can be a columnist, an editor, a feature writer or maybe an author. Whatever you decide to be, keep practising your craft. That 10,000 hours rule definitely works!